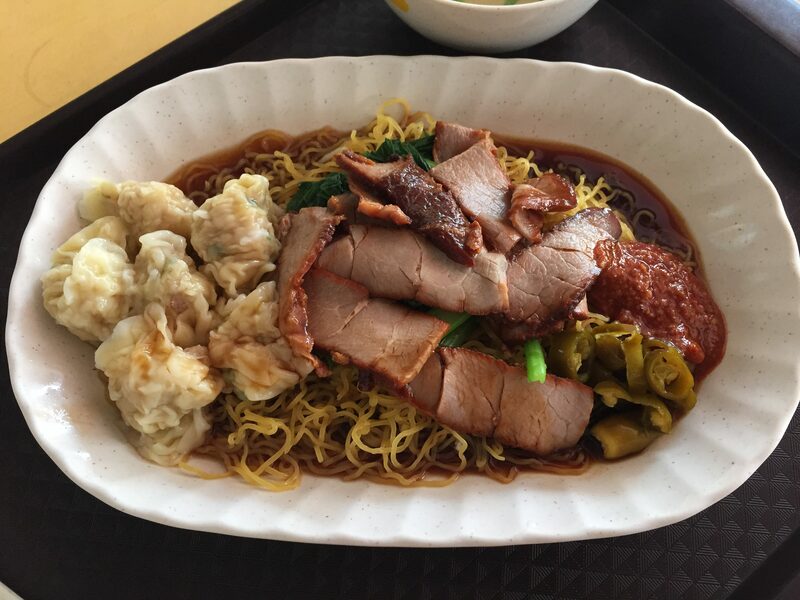 There are at least three major styles of wonton mee (noodles) in Singapore. 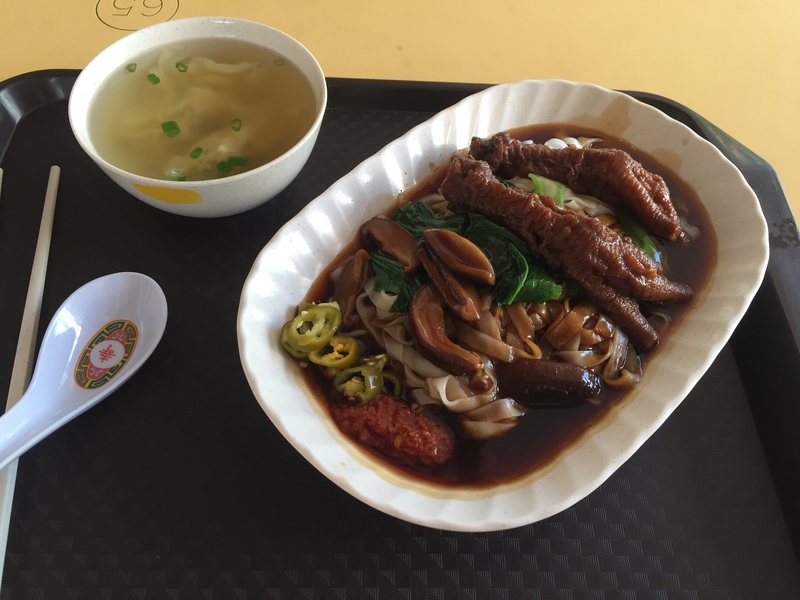 The “Singapore style” is characterized by sweet black sauce, dousing noodles that get soggier by the second, and a helping of red charsiew. The wontons are more metaphorically accurate, willowy sleeves of cooked dough surrounding a small core of meat. Some shops mix it up and have a soup based wonton, and a fried wonton covered in a tougher dough skin for an optimal mix of wonton textures. The noodles are treated with lye to make them have a crunchy texture. The Singapore wonton noodle will often have pickled green chilli for sourness and some type of ground red chilli sauce. The main strength of the style is its melting-pot approach to sauces, having the potential to be a really complex array of textures and tastes. The main weakness of the style is that the sweet black sauce often upsets the balance of the entire bowl of noodles. The “Thai style” has minimal dressing and is served with a more chewy noodle, akin to kolo mee in East Malaysia. I believe the difference is these noodles are not lye-treated (but I could be wrong). Popular fix-ins are cubes of lard & fried wontons. The main strength and weakness of the style lies in the noodles. Like kolo mee, an overly doughy noodle is cloying, but a fist-sized clump of uncooked noodle, drizzled with lard and cooked al dente, is perfect. The Hong Kong style is a very crunchy noodle that is served with a light soup, and served with prawn dumplings. The noodles are lye-treated, like the Singapore version, but are usually less soggy. At Mak’s Noodle in HK Central, they serve it on a spoon. The wontons are generally stuffed with shrimp, and have a crunchy texture. 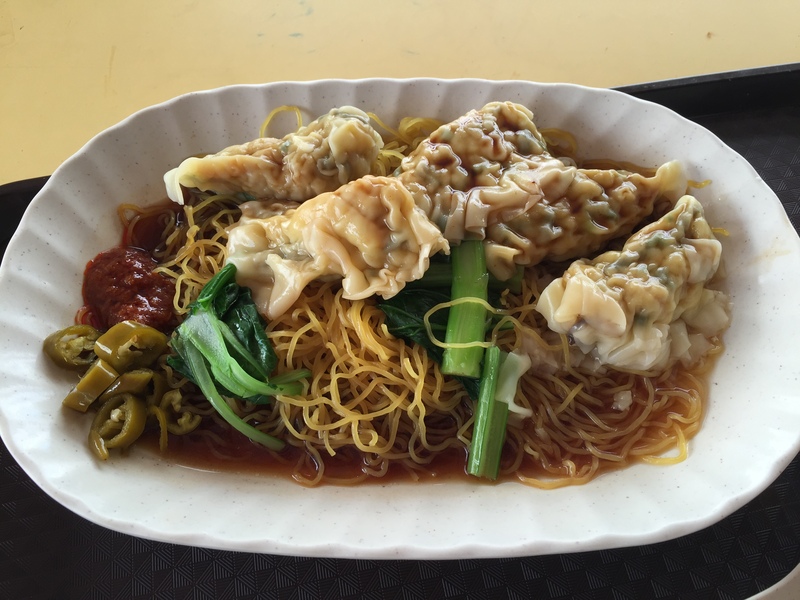 The strengths of this style are in the wontons (called by the alternate name “shuijiao” in Singapore), which are simply the most substantial, and the crunchy noodles. The weaknesses are an occasional over-use of lye in the noodle itself, which makes the noodle having an artificial crunchy texture. Despite being raised in Singapore, of these three “pure” styles, I find myself preferring the HK style the best. I prefer my wontons hearty-sized and my noodles to have a balanced taste. 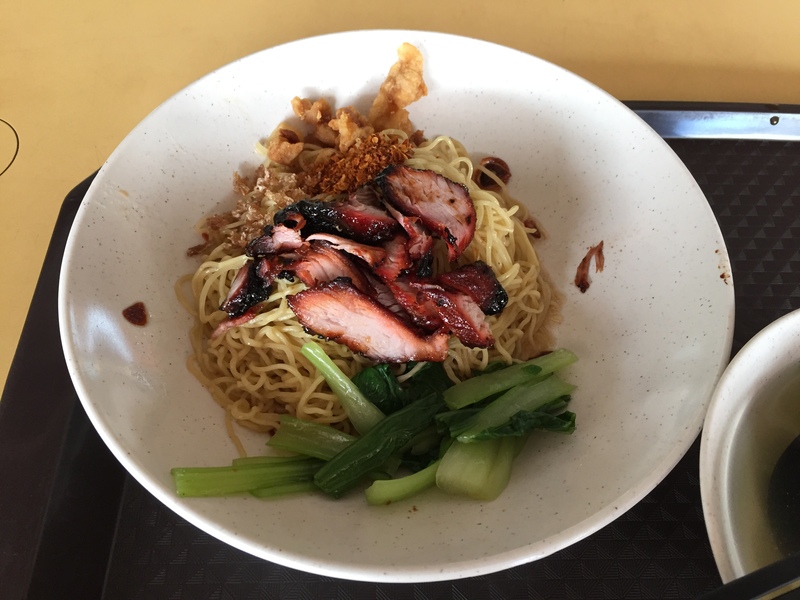 I recently moved to the West of Singapore, near Empress Road Hawker Centre. I have often had breakfast at two of the centre’s wonton noodle stores, and I find them excellent in their individual way. Ah Wing’s wanton noodles are some of the best wonton noodles I’ve had anywhere. The entry-level “wonton noodles” are excellent. The charsiew is better than the crimson shoe leather that plagues so many noodles, being both black and tender. The wontons are a mix of pork and prawn, which gives it a more interesting texture over pork alone. The owner does not take metaphorical license from the name wonton (or “cloud-swallowing”) to dish a negligible portion of meat into wisps of flour. His wontons are golfball-sized, and the portions are generous. It comes as no surprise that the owner is an emigre from HK, and is run by him and his wife. But the best-dish at the stall are the couple’s shuijiao noodles. Shuijiao, a codename for HK-style wontons, are usually available at every wonton mee stall in Singapore. The only difference is that the shuijiao usually feature a mix of prawn and pork, whereas HK-style wontons are usually pure or mostly prawn. What sets Ah Wing’s shuijiao apart from others in Singapore is the mix of ingredients – about 60-70% prawn, the remainder pork and strips of a crunchy black fungus. Yet it is not a textbook HK style noodle. The sauce base is similar to the Singapore style, with a mix of green chilli, a savory chilli sauce, and a dark sauce base. The key difference is that the dark sauce is not sweet black sauce, but a light soy-sauce that harmonizes well with the other ingredients. The noodle is crunchy, but not artificially so. Another minor point: The soup is not laced with MSG, making it surprisingly drinkable (I have no quarrels with MSG as an ingredient, but find it overused). 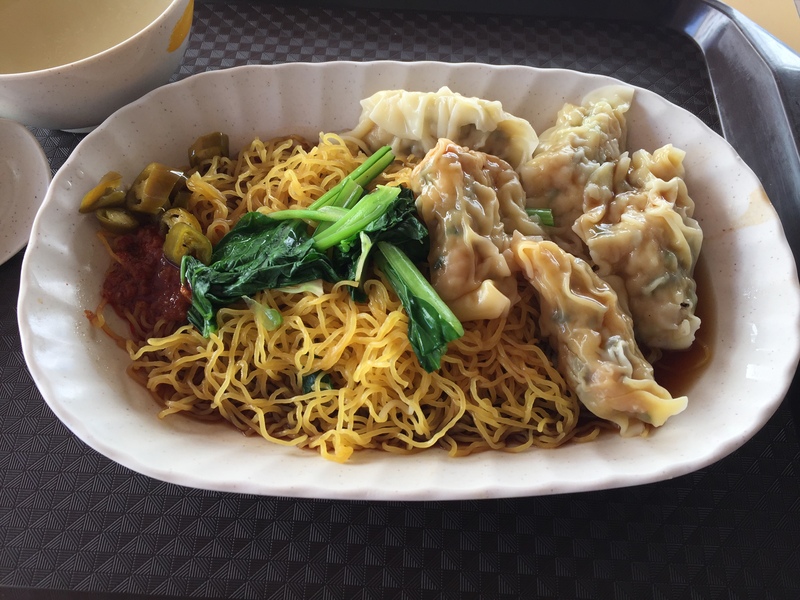 It is possibly the most balanced wonton noodle I have eaten – from sauce, to noodle, to wonton, and combines the best of the Singapore and HK styles. I do not exaggerate – I had these noodles almost everyday for breakfast in a three-week period, and found myself rarely tiring of them. 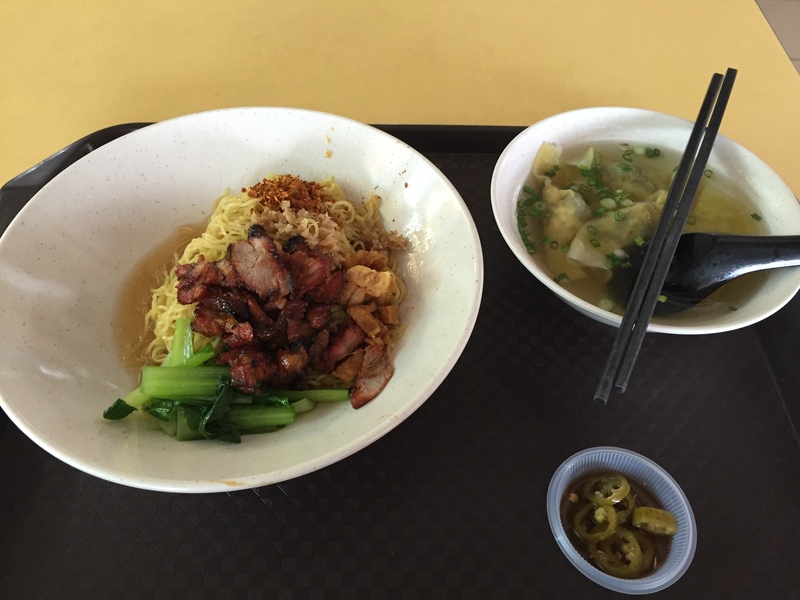 Chen Long wanton noodles are operated by a young couple, who set up their shop late last year. 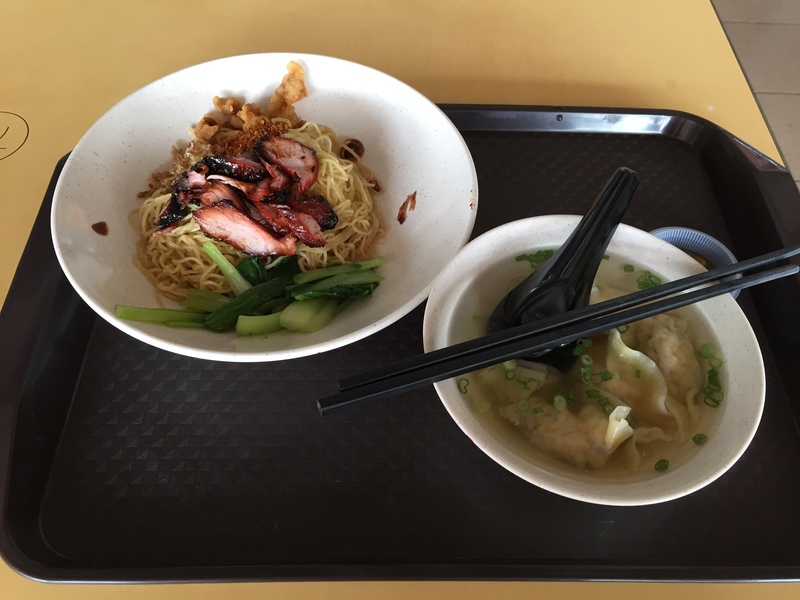 They are located a row behind Ah Wing’s wonton noodle in Empress Road, and have their own following. They do not directly compete with Ah Wing’s. 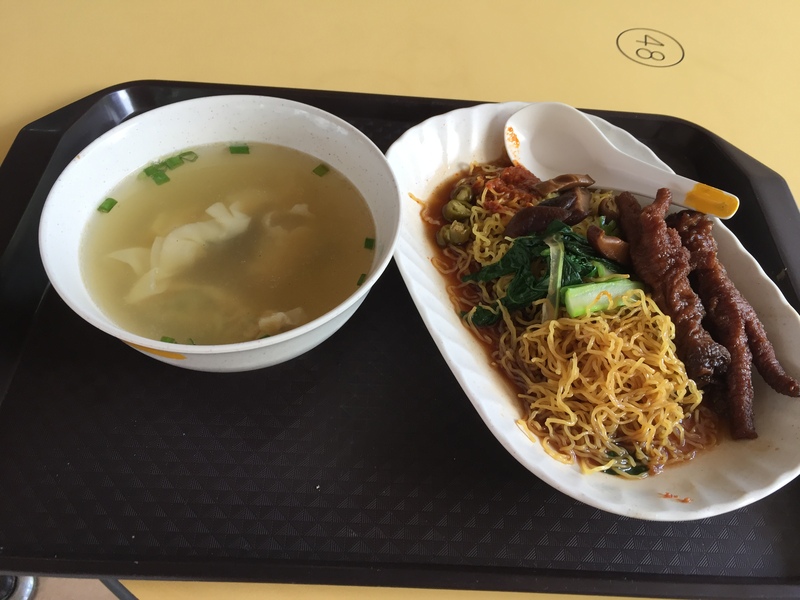 Instead, they offer the textbook Singapore-style wonton noodles and a Thai style wonton noodle. The Singapore style wonton noodles are not bad, but they use the same sweet dark sauce base which is not my favorite. I however am an admirer of their Thai style wonton noodles. It is the definition of unhealthy food. The soup wontons are rather small, but the fried wontons have a delightful crunch, the whole bowl of noodles is dressed in lard bits and lard oil, and the dark sugar-coated charsiew is crunchy, especially if you ask for the cuttings at the burnt ends. very interesting post – and welcome back to singapore ! ah wing’s look very good – will have to try that soon.